It was love at first sight when I saw the Bird of Paradise dress ($138) by Free People while browsing around the Urban Outfitters website. 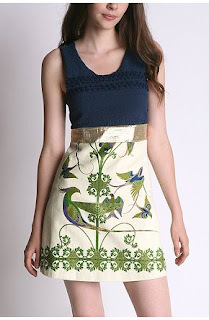 Feminine but not froufrou in its simplistic silhouette, the green and blue hues and the gilt-edge detail on the birds remind me of cloisonne beads. The dress also conjures happy memories of a peaceful afternoon spent at El Museo Dolores Olmedo in Mexico City, where peacocks wandered freely all over the estate gardens as I strolled from room to room, admiring works by Diego Rivera and Frida Kahlo. Ah, to once again be in a museum populated by peacocks! It's like a scene straight from some Latin American magic realism oeuvre. Anyway, I digress. The dress is cute, no? What an amazing find. Free People is often so hit or miss but this is definitely a winner. hi lisa! i enjoy reading your blog immensely. i'm glad you switched to here so i can comment. happy writing! Wow, since when did Urban Outfitters start hawking Betsey Johnson (selling BJs, oh my!)? What an interesting skirt! I love the silhouetee of it too and how it accentuates a narrow waist.